Quest Cell Life is a comprehensive formula designed to provide optimum levels of nutrients needed for immune support. Vitamins A & C and the minerals zinc, selenium and copper can contribute to the normal functioning of the immune system. Vitamins C & E and the minerals zinc and selenium may also help protect body cells against oxidative stress. 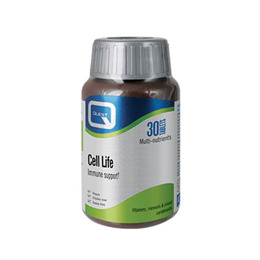 Why use Quest Cell Life? High levels of antioxidants may support healthy cells. Optimal combination of water and fat soluble antioxidants. Contains antioxidants compounds found naturally in fruits and vegetables. Contains zinc and selenium, used by the body to make antioxidant enzymes. Ideal for smokers, heavy exercisers, those living in polluted areas and the over 40s, who have an especially high requirement for antioxidants. Optimum levels of 12 antioxidant nutrients. Amino acid chelated minerals maximise absorption of the mineral antioxidants in the formula. Vitamin C (hydroxypropylmethylcellulose), Bulking agent: Microcrystalline cellulose, Vitamin E (from soya), Dicalcium Phosphate, Mineral amino acid blend (providing zinc oxide, manganese carbonate, copper sulphate pentahydrate and sodium selenite complexed with citric acid, glycine and hydrolysed rice protein), Lutein preparation (providing lutein esters, zeaxanthin esters, with agar, sucrose, palm oil, ascorbyl palmitate, calcium stearate, sodium ascorbate, mixed tocopherols (soya)), Mixed carotenoids (providing beta-carotene, alpha-carotene, cryptoxanthin, zeaxanthin and lutein with ascorbic acid, maltodextrin), Vitamin A (with antioxidant: tocopherols (soya) and tricalcium phosphate), Cellulose, Magnesium Stearate, Anti-caking agent: Silicon dioxide, Glazing agent: Hydroxypropylmethylcellulose. Below are reviews of Cell Life - Antioxidant Nutrients - 30 Tablets by bodykind customers. If you have tried this product we'd love to hear what you think so please leave a review.